K-fashion showroom ‘The Selects’ opens in New York City. September. 11, 2018 07:46. by Yong Park parky@donga.com. At around 7 p.m. Saturday (local time), on Greene Street in the Soho district of Manhattan in New York City, some 300 fashion designers, models, and buyers flocked to the space across the store of Hermes, a French luxury brand. With those braving the rain in attendance, a collaborative project showroom “The Selects” opened where Korean fashion (K-fashion) brands can exhibit their works. Saturday’s opening ceremony started with the music and video of K-pop girl band Red Velvet, one of the collaborative partners of The Selects. As soon as the video ended, curtains in the corner of the showroom were drawn back. Models, who had been standing still like mannequins, began to walk forward all at once in the clothes of Korean designers, making the audience exclaim at the scene. Korean fashion designers also showed off their presence. 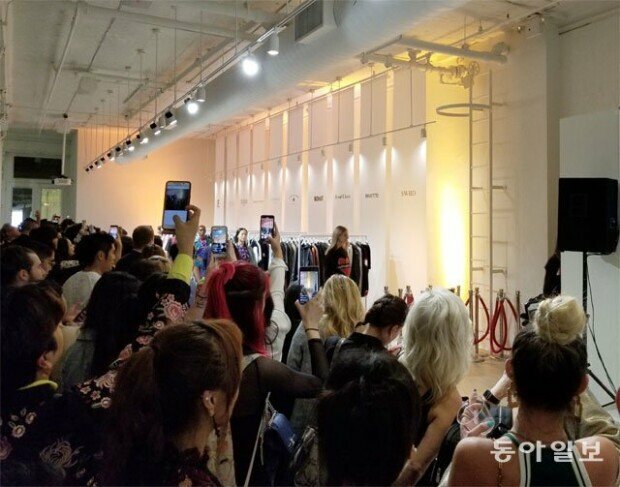 At Concept Korea, the government-sponsored fashion show held during New York Fashion Week, Korea’s street fashion brand “IISE” made its debut in the city. Kim In-tae (31) and his brother Kim In-gyu (30), both born and raised in New Jersey, visited Korea in 2013 and started the brand in Seoul after being inspired by the country’s traditional architecture and culture. With their presentation in New York, these Korean American designers are now advancing to the U.S. market where they grew up. Another Korean fashion designer Yang Yuna, whose collection was launched at duty free store of John F. Kennedy Airport in New York, also held her own show to much acclaim. Also, K-fashion brand KUHO held a presentation in Manhattan.